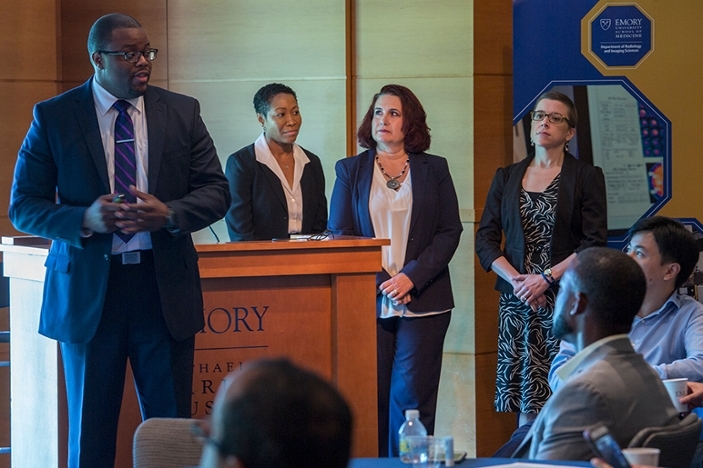 Three teams studied three different issues affecting either Emory Radiology or radiology as a specialty. ﻿Three teams studied three different issues affecting either Emory Radiology or radiology as a specialty. “This is my favorite event of the year,” a beaming Carolyn Meltzer confessed to a smiling crowd of nearly 75 colleagues and their family members. 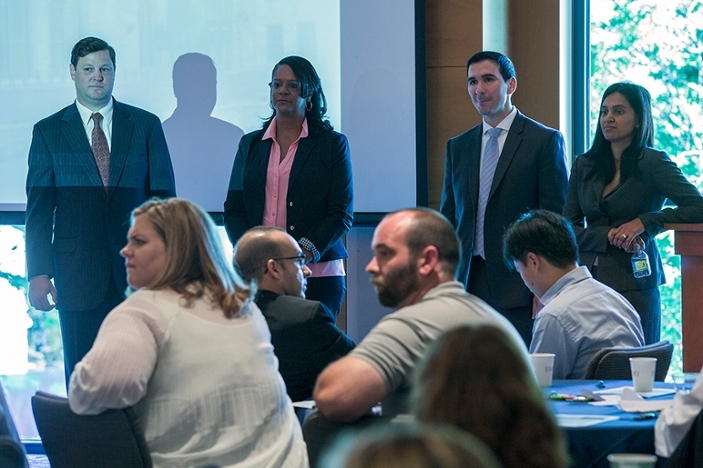 The chair of the Department of Radiology and Imaging Sciences was talking about—and at—the Radiology Leadership Academy (RLA) graduation program on June 9. 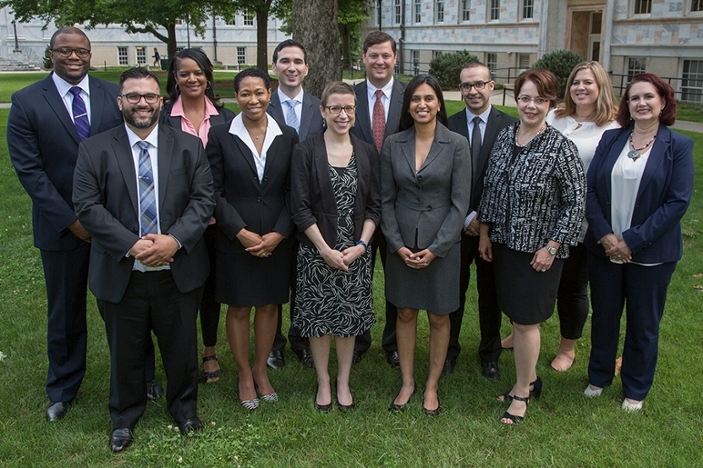 Launched in 2009, RLA deliberately mixes twelve emerging leaders from across the department—clinical and research faculty, residents, clinical and administrative staff, and administrators—for leadership skills development, knowledge building, and team work. The class meets monthly to study state-of-the-art leadership tools and theories and learn about issues and advancements challenging the department. Class members devote countless extra hours working in teams on a real-world Business of Radiology project. 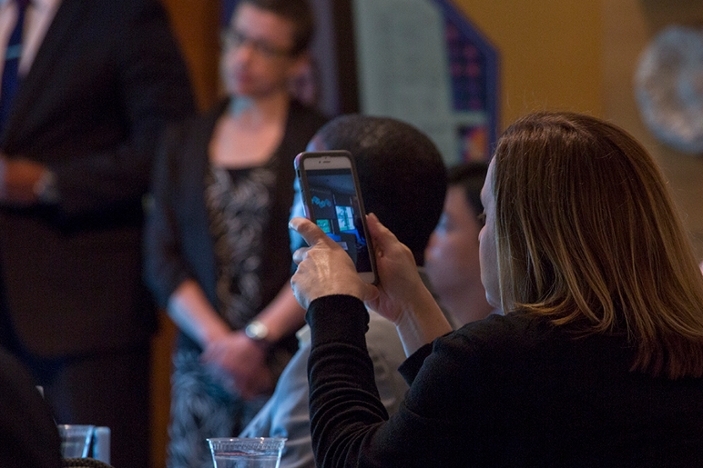 With a potent cocktail of excitement and nervousness plus a shot or four of caffeine fueling them, the Radiology Leadership Academy Class of 2017 rocketed through their Business of Radiology capstone project presentations. Three teams studied three different issues affecting either Emory Radiology or radiology as a specialty. Their proposed solutions mixed creativity with practicality, with careful measures of impact and cost used to build the case for department leaders to consider adopting their recommendations. Project Description: Image-guided procedures are a key service provided by the Department of Radiology and Imaging Sciences, and integral to the care of inpatients throughout Emory Healthcare. Team RAVE evaluated and optimized pre-procedural documentation on inpatient image-guided procedures. Through retrospective review the team found this documentation absent in many cases, and if present, inconsistent. Surveys of stakeholders confirmed perceived weaknesses of existing protocols, with >75% of clinicians and proceduralists believing that documentation could improve patient care. A two-week feasibility trial of documentation was conducted. Post-trial data showed most clinicians preferred to continue the new documentation practice with 43% believing it had a direct patient care benefit. By routinely performing such standardized pre-procedural documentation, Emory Radiology could increase satisfaction among referring clinicians, improve patient care and communication, and increase radiology visibility throughout the hospital. Team RAVE further identified a subset of pre-procedural documentation—inpatient consultations—that can be billed, and generated a revenue model which demonstrated a significant potential increase in departmental income. This new revenue could be used to offset costs related to optimizing this service if permanently implemented. Project Description: There is a lower proportion of women choosing radiology as a specialty, when compared to the gender mix in medical residencies and other specialties. In fact, the male to female ratio in Radiology hasn’t changed much in the last 30 years. Research shows that creating a welcoming environment and inviting women medical students to connect with radiologists as role models and mentors positively influences their career choices. 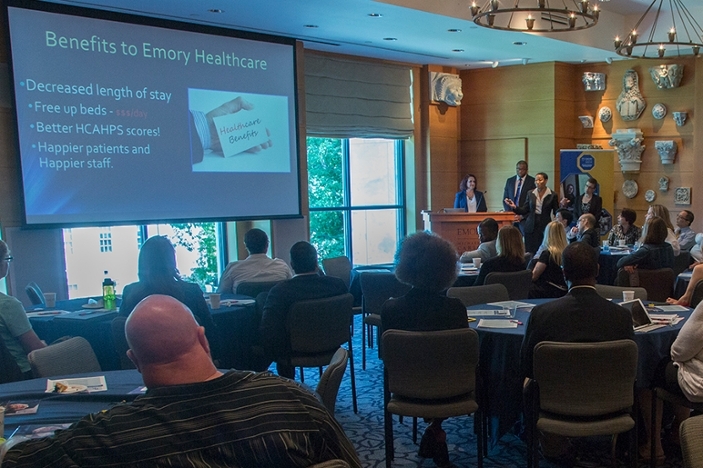 In hopes of cultivating such opportunities and motivating medical students to pursue a career in Radiology, Team RISE hosted an event showcasing the remarkable lives of two women in Emory Radiology. From the radiologists’ candid sharing about their professional journeys, participants discovered the joy of working in radiology, and had an opportunity to meet and mingle with faculty and establish mentorship relations. Team RISE hopes to create a lasting outreach program through additional events and broadcasting to impact a national audience of women medical students. Project Description: After noticing a pattern of inpatients being unprepared for their interventional radiology procedures, which subsequently lead to unnecessary delays, Team RadInpaCT sought to create a care partnership between the radiology department and a targeted inpatient unit. Through this relationship, the team investigated the reasons that patients were unprepared. The team then developed and tested a strategy for decreasing the number of patients who were not ready when called for their interventional procedures, with the larger goal of decreasing delays, improving efficiency, reducing costs, and creating an excellent patient experience.